Mode Madeleine: Paris 2012: Shoppinggg Goodies!! Here are a few piccies of some of the goodies I picked up in Le Paris! A month on and I'm yearning to go back now!! Beautiful munchies...almost too beautiful to eat, don't you agree!? Notebooks galore...I'm pretty sure this is every bloggers' mini obsession! I love this little ballerina postcard with the Eiffel tower on her head! Simply charming. So many delicious postcards all ready to be scrapbooked and collaged! 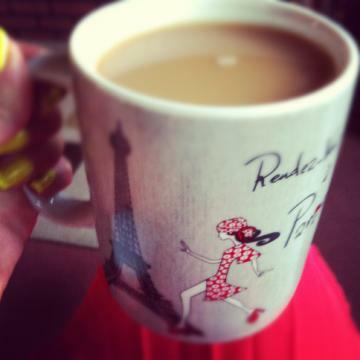 Of course, had to find a pretty Parisian mug to add to my collection back home. My gorgeous silk vintage bag and vintage scarf!